The 8.00 bottle of water to make coffee in the room. Which hotels are closest to the Yucca Valley airport? Where to stay near top Yucca Valley attractions? What kind of hotels are in Yucca Valley? Which hotel chains are in Yucca Valley? Budget-minded travelers will find good deals in Yucca Valley, and visitors give high marks for the beautiful parks and top-notch restaurants. Tourists can also enjoy the city's live music and entertainment choices. A top sight in the area is Palm Springs Aerial Tramway. The city's natural setting is picturesque, including the parks and Yucca Valley Community Park. 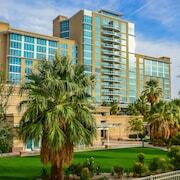 A couple of additional sights to add to your agenda are California Welcome Center and Hi-Desert Nature Museum. Pioneertown Motel - With a stay at this 2.5-star motel, guests can enjoy access to free parking and concierge services, along with free WiFi. 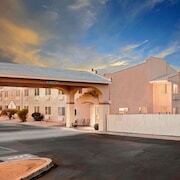 It's a favorite with Expedia travelers for its helpful staff and comfortable beds. 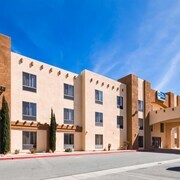 Best Western Joshua Tree Hotel & Suites - Our customers like the overall value and clean, comfortable rooms at this hotel. With a stay at this 2.5-star hotel, guests can enjoy access to free breakfast and an outdoor pool, along with free WiFi. 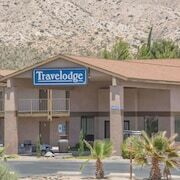 Super 8 Yucca Valley / Joshua Tree National Park Area - With a stay at this 2-star motel, guests can enjoy access to free breakfast and an outdoor pool, along with free WiFi. Expedia customers like its overall value and pool. Popular places to visit in the area include Palm Springs Aerial Tramway, located 19.8 mi (31.8 from the city center, and Palm Springs Air Museum, which is 20.5 mi (33 away. Are there hotels in cities near Yucca Valley? 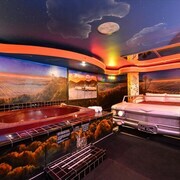 Explore Yucca Valley with Expedia.com.au’s Travel Guides to find the best flights, cars, holiday packages and more!